September | 2013 | Where's Merrill? A sincere big thank-you to all readers and reviewers of my genealogical thriller “Where’s Merrill?” which today made it to the Top Twenty section of Amazon’s bestselling ebook Historical Thrillers. That’s my kind of thrill. Also in Top 100 of all book types, Historical Thrillers. I can’t see WM dislodging Stephen King’s latest offering from #1 though! Retrieved evidence verifies that the wild residents of the Ox Mountains in County Sligo, and in particular the Catholic parishioners of Kilmacteigue living by the Windy Gap overlooking Lough Talt, were highly-regarded distillers of some of the finest Mountain Dew ever sipped in Ireland. 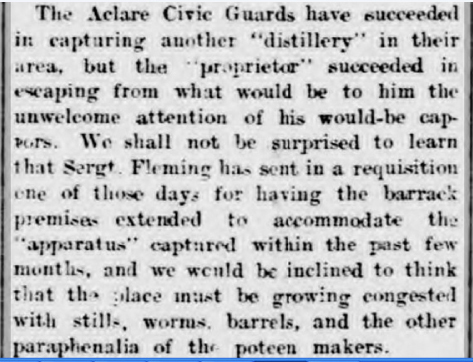 Highly-regarded, that is, by fellow aficionados of the home-brewed spirit known as Poteen. 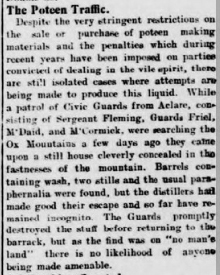 The British authorities and later the Civic Guard of the Irish Free State took a different view to the producers and imbibers of duty-free liquor. 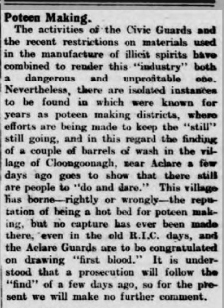 As a result, an ongoing clandestine war was fought around the south Sligo mountains and boglands for centuries. 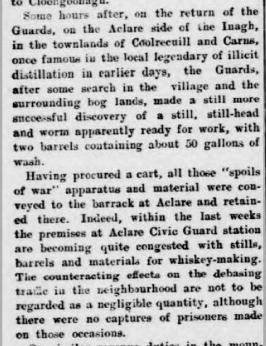 The policing agencies always boasted of victories in isolated skirmishes, but truth be told, the distillers were never beaten. The “illegal” trading of mysterious lethal brews still persists to this day – albeit that the receptacles containing the wondrous concoction are more likely to be discarded white lemonade bottles these days (if the plastic does not melt). 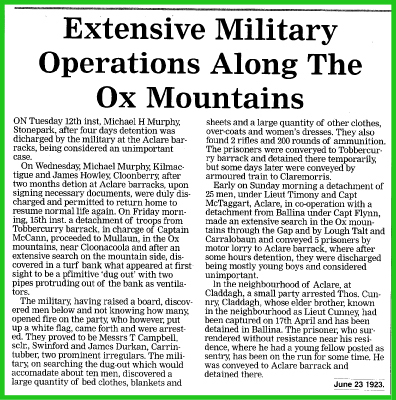 “ANOTHER ONE” led to the Civic Guards retreating to their Barracks in Aclare. 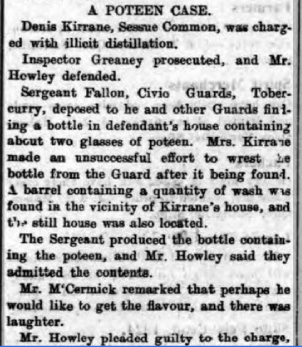 The Poteen Pushers could not be stopped. Casual visitors to Cloongoonagh carried on their everyday business. Christmas was coming. Everybody was happy – even the Guards and the Judge, sampling the finest Mountain Dew prior to enjoying their fattened goose dinners. During a recent research project, I was shocked to come across an Irish death certificate for a baby girl named Martha aged just under 15 months upon which the Certified Cause of Death was declared by a physician to be “Marasmus.” This is the condition which often claims the lives of very under-nourished infants living in areas of severe famine. We have all seen the haunting images of terrified black children with bloated tummies and heads attached to skeletal frames filmed during recent famines in war-torn African countries. The medical term for the distorted human condition you were witnessing is marasmus. However, my Irish death cert of concern was not from the Great Famine era of Ireland, namely the late 1840’s. Civil death registration in Ireland did not commence until 1864. This particular death certificate, shown below, dated from 1877 when Ireland had overcome the worst of the economic depression in the post-Famine years. So how could a one year-old baby just starve to death in a West of Ireland family home at this time? This was a scenario which troubled me, especially when my research revealed that baby Martha had six older siblings who all appeared to survive childhood with relative and commendable ease. The death of Martha occurred on 28th February 1877 in the County Galway village of Kilchreest. The baby’s parents were Patrick & Margaret. On first viewing the certificate I noted that Margaret reported the death, and this was a common but tragic duty for the mothers of infants who died very young, but usually as a result of fever or generally sub-standard living conditions. MARASMUS though! This diagnosis bothered me. It was not until my client commissioned me to investigate more fully the background of her Irish ancestors that I discovered the whole sorry tale of poor Martha’s last few weeks on earth. The story was more tragic than I could have imagined. In being asked to compile complete Family Trees, it was one of my tasks to find out when Martha’s parents died. All of her surviving older siblings emigrated to America, but Martha’s parents never crossed the Atlantic Ocean to join them, and they were also absent from the 1901 Irish census. Logically, both of Martha’s parents must have died before April 1901 and after youngest child Martha’s conception in 1875. I eventually found a matching death record for Martha’s father, Patrick; he died in the year 1900 as a widower. For days after, I struggled to locate any reference at all to the demise of Martha’s mother, Margaret. She was dead by 1900, and she reported baby Martha’s death in February 1877, yet there was no matching death record in the intervening years in County Galway, or the whole of Ireland, or anywhere in the civilized world for that matter. I was stumped – until I made an accidental discovery. For some reason I cannot recall, I carried out my search for Margaret’s death record one more time. On this occasion, I must have left the span of years for my database search engine to interrogate as Martha’s DOB (in 1875) up until 1900. Up popped mother Margaret’s death registration …. in November 1876 …. so mother Margaret had died three months before her baby Martha. Ugh? So who was the female with the same name as Martha’s mother who registered the baby’s death. It took a while before the truth dawned on me. 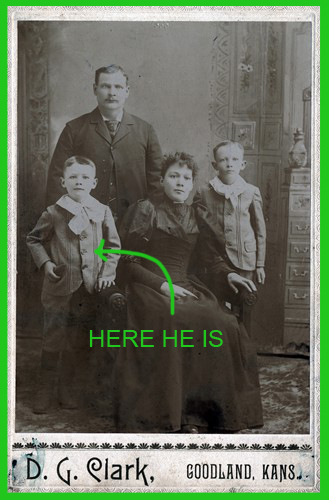 Earlier research had determined that Martha’s father, Patrick, was most likely an illegitimate child. Patrick could not name his father when he married Margaret, in spite of the fact that this was a normal legal obligation prior to a marriage being recognized by the British state. So Patrick had no family network to step in when his wife tragically died and left him with seven children to raise single-handedly. Patrick worked on a country estate looking after the land and domestic animals on behalf of wealthy employers, and I reckon that he felt forced to carry on with his work in order to keep his family fed, after Feb 1877. Then it HIT me! Patrick’s eldest daughter was Margaret, born in 1864. This girl was aged just 12 years when her mother died …. and 12 year-old Margaret then became the surrogate mother for her six tiny siblings. Somehow, she managed to keep them all alive as her father Patrick spent long hours away from the family’s cottage in Kilchreest village …. but baby Martha needed a proper biological mother. Having absorbed these facts, it then became apparent that little Margaret suffered the final indignity of having to formally report the death of her baby sister to the local Registrar. 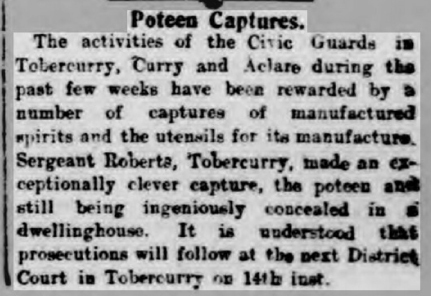 Technically, Margaret was under the legal age to carry out such a sad task – and where was her father Patrick when this matter was reported on 14th March 1877? In fact, where was any neighbourhood support in these days before Social Workers stepped in to ease the burden on dysfunctional families? Shame on them all. Perhaps the worst castigation should be spared for the family’s local physician. 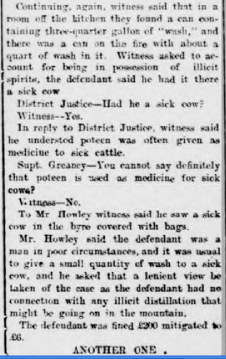 This man calmly advised the Registrar that poor Martha’s condition of Marasmus had been certified for eight weeks prior to death! In other words, this so-called doctor was aware of Martha’s drastic under-nourishment by early January 1877 at the latest, yet he left a dying baby in the care of her 12 year-old sister …. and just walked away from the evolving tragedy. The only good news is that Martha’s siblings all escaped the Irish poverty trap and all eventually settled in various parts of America. Amazingly, one of Martha’s sisters lived to the grand old age of 103 years and retained a computer-like memory right up until her dying day. When this day came in 1972, she could still recount the story of her baby sister who died back in the Galway cottage homestead …. where no-one seemed to care about fatal circumstances which scarred young minds forever. I am not sure why the brave rebels hoarded women’s dresses in their underground bunker, alongside 200 rounds of ammunition. For disguise, I suppose – but it must have been quite a sight to see armed ladies with whiskers sneaking over the Ox Mountains. 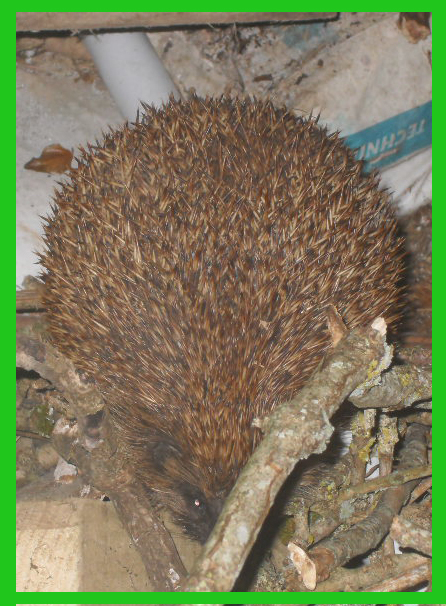 For about the last two weeks, we’ve been feeding a hedgehog which was spotted in our front garden late one night. We understood that these creatures were very secretive and rarely ventured far from their nests – but we noticed that our visitor started to regularly take his feed of meat and biscuits by our illuminated front door every night at about 11 pm. By placing his food nearer to one of our outdoor security cameras, we also started watching him arrive and depart (after about 15 minutes of munching) in glorious infra-red night vision. Our hedgehog was a large adult and we christened him Merrill. We were shocked on Saturday morning though, when we saw how huge our Merrill actually was in daylight. For reasons unknown, this normally nocturnal dweller, had decided to take a stroll around our garden in broad daylight. He was larger than a typical domestic cat. Merrill proceeded to take a five minute jog around a circuit of our house. Hedgehogs can move at a surprisingly high pace, especially big fellows like mega-Merrill. 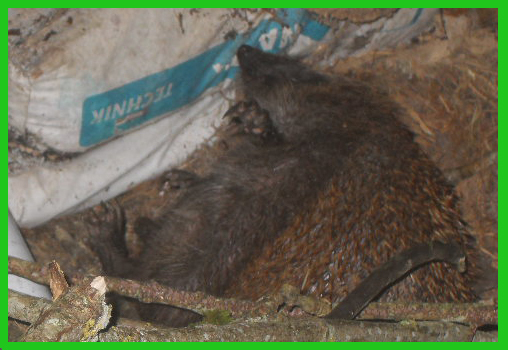 He eventually ambled into our old stone barn and had a rummage through my stocks of winter wood fuel. Merrill sensed that I had spotted him and hid behind a thin branch of fallen timber. It wasn’t the best of hiding places. Merrill is obviously grateful for his free dinners in the run-up to hibernation time and has become remarkably tame. He is not spooked by bright lights at night, nor by humans observing him at close quarters. Stray cats have approached him but his natural spiky defense system in combination with his vast size means that would-be predators soon lose interest in our Merrill. Only when he’s ready, with a full belly, does he trot off towards the garden fence and into a natural hollow protected by shrubbery. I managed to capture the photo above, by chance, when Merrill scrambled up to the top of my wood pile and then lost his footing. He rolled backwards doing gentle somersaults, and had a soft landing in the hay. Feeling rather embarrassed he then went home for the day, and no doubt had a long sleep. At long last, I found Merrill – but I’ve promised to keep his address and whereabouts secret.